The story begins as Alice is sitting by a river bank on a summer day. 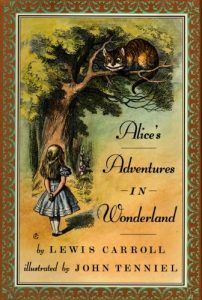 As she is reading she sees over her sister’s shoulder, a White Rabbit in a waistcoat running by. The White Rabbit pulls a watch out of his pocket and says that he is late. With that, he jumps into the rabbit hole. Alice decides to follow the rabbit down the hole until she comes to a hallway that has doors along either side. Alice finds a key and unlocks one of the doors. Through the door she sees a beautiful garden, but she is moved to tears because she cannot fit through the tiny door. Nearby she finds a bottle marked “DRINK ME.” Alice drinks the contents of the bottle and immediately begins to shrink to the size of the door. However, she left the key on the table which is now out of her reach. At that moment Alice sees a cake marked “EAT ME,” After Alice eats the cake she begins to grow to an enormous size. She begins to cry and her tears become sea. As Alice is treading in the sea of her own tears she meets a Mouse. The Mouse helps Alice to shore where they encounter several other animals. The animals engage in a “Caucus Race.” Alice tells the animals about her cat, “Dinah,” and this scares the animals away. Alice is alone once again. Alice encounters the White Rabbit again. The White Rabbit mistakes her for one of his servants and sends her to his house to retrieve his things. While in the White Rabbit’s house, Alice finds an unmarked bottle of liquid which she drinks. This time she grows to an enormous size. The White Rabbit grows angry, and Alice swats him away. The animals then throw rocks at Alice which magically turn into cakes. When she eats one of the cakes, Alice again shrinks. She escapes into a forest. In the forest Alice meets a Caterpillar who sits on a mushroom smoking a hookah. Alice argues with the Caterpillar who eventually slinks away. Before he leaves he tells her that some parts of the mushroom will make her grow large and others will make her grow small. When Alice takes a bite of the mushroom, her neck grows extremely long and sticks out over the trees. She is attacked by a pigeon who thinks she is a serpent come to steal its eggs. Alice tries another part of the mushroom and this time she shrinks to her normal size. She continues to wander until she encounters the house of the Duchess. She finds the Duchess nursing a squealing baby. She also sees the grinning Cheshire Cat and sees a cook pouring large amounts of pepper into a large pot of soup. The Duchess is extremely rude, and Alice simply leaves in order to get ready for a croquet game with the Queen. As she is leaving, the Duchess hands her the baby which turns out to be a pig. Alice immediately releases the pig. She then enters the forest again a sees the Cheshire Cat. The Cheshire Cat tells Alice that everyone in Wonderland is mad. He even says that Alice is mad. The Cheshire Cat tells Alice how to find the house of the March Hare and fades to nothing but his grin. After finding her way to the March Hare’s house, Alice finds him having tea with the Mad Hatter and the Dormouse. They treat her rudely and she stands next to the table Alice learns that because they have the wrong time, they are perpetually trapped in tea-time. After they continue to be ruse, Alice ventures back into the forest. She happens upon a tree that has a door, and after she enters she finds herself back in the hall where she began. Taking a bite of mushroom, she shrinks and uses the key to enter the garden. Alice rescues several gardeners from the wrath of the Queen of Hearts. She then plays a strange game of croquet with the Queen. The grounds are marked by hills, the mallets are made of live flamingos and hedgehogs, and the Queen runs around ordering people’s heads off. In the confusion, Alice again encounters the Cheshire Cat. He asks her how she is doing. The King of Hearts interrupts them, and the Cheshire Cat rudely dismisses him. The King is furious and orders the execution of the Cheshire Cat, but since the Cheshire Cat is nothing but a floating head, no one knows how to proceed. The Duchess then attempts to befriend Alice, but she makes Alice uncomfortable. The Queen of Hearts interrupts this and explains to Alice that she must go to the Mock Turtle to hear his story. Alice goes to find the Mock Turtle accompanied by the Gryphon. Alice tells the Mock Turtle and the Gryphon of her experiences in Wonderland as they listen attentively. The Mock Turtle explains his story when they hear that a trial is soon to begin. They all return to the croquet grounds. It seems that the Knave of Hearts stands accused of the stealing the Queen’s tarts. The King of Hearts leads the trial and witnesses recount their stories. Alice witnesses the Mad Hatter and the Cook offer testimony but none of it makes sense. Suddenly the White Rabbit calls Alice to the stand. The King then goes into a line of questioning which makes no sense when the White Rabbit offers evidence in the form of a poem alleged to be written by the Knave. The poem is also nonsense, but the King interprets it as an admission of guilt on the part of the Knave. Alice tries to intervene and explain to the King that he is wrong. With this, the Queen is infuriated and order Alice to be executed. Alice then grows to an enormous size and knocks over the Queens army which is really just playing cards. Alice suddenly wakes up to find that she is still laying in her sister’s lap. Alice tells her sister of her dream and goes inside for tea. Her sister is left wondering about Alice’s adventures.